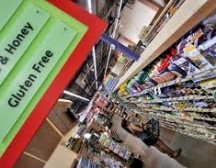 Home » Uncategorized » Gluten and Weight Loss: Fact or Myth? Gluten and Weight Loss: Fact or Myth? Comments Off on Gluten and Weight Loss: Fact or Myth? If you’ve eaten at a restaurant, scanned boxes at the supermarket, or browsed through a fitness-related magazine or website any time recently, you’ve most likely seen a certain phrase appear with increasing regularity: gluten-free. This distinction seems to be among the most popular health and fitness buzzwords at the moment, and it is most often mentioned in conjunction with weight loss. Is it yet another fad diet? And while gluten intolerance is legitimate, not everyone who eats gluten-free needs to do so, and it is not a magic cure-all for health. Gluten is a type of protein found in wheat, and for those who have celiac disease, eating gluten can result in an uncomfortable reaction that damages the lining of the small intestine. This can trigger diarrhea, anemia, skin rash, and prevents nutrients from being digested. However, estimates suggest only about 1 percent of Americans actually have celiac disease. However some people do exhibit sensitivity to gluten and wheat products although it is not diagnosed as full-blown celiac disease. Still, many more people than just those with gluten sensitivities follow gluten-free diets, often lured by the possibility of weight loss. Gluten Free for Weight Loss? Weight loss can result from gluten-free diets, but that tends to happen simply because cutting out gluten dramatically reduces the amount and types of food you can eat. Additionally, many calorie-dense foods, such as pasta, breads and cakes contain gluten, which means that those following gluten-free diets have fewer choices as to what to eat. As well, the food choices that are gluten-free tend to be less calorie-dense foods, such as meats, fish, poultry, fruits and vegetables. There are some starches that can be consumed on a gluten free diet, including rice, quinoa, corn and cornmeal, beans, flax and nuts. In general, most gluten-free foods are equivalent to foods recommended for a healthy diet. Eating protein sources, fruits and vegetables provides your body with nutrients, but as the professionals at Johns Creek Dermatology and Family Medicine note – foods such as whole wheat products, which contain gluten, also provide valuable nutrients. In addition, products touting the gluten-free label may have added sugars and fats to substitute for the binding features of gluten. As a result, going gluten-free can deprive you of a well-rounded, balanced diet that would provide optimal health. Gluten does not cause weight gain, nor does its absence ensure weight loss. It is possible to lose weight efficiently and effectively with gluten-containing products in your diet, as long as they are whole grain and not over-processed. Of course, weight loss can be difficult for many, which is why it is important to speak with Dr. Zack Charkawi, our whole health professional at Johns Creek Dermatology and Family Medicine. The staff at this family medicine services provider located in Johns Creek, serving South Forsyth, Gwinnett, North Fulton counties and surrounding North Atlanta area, can help you craft an effective weight management plan that still allows you to get the important B vitamins, fiber, and iron that wheat products provide.